Hey PJ, you once mentioned defoliation late in flower will cause an abundance of auxin to be produced, and that you’d leave it up to us to learn what would happen as a result and why we don’t want large amounts of auxin being produced in late flowering. You have a good memory, and I've preached it under several names since 05. Now my hypothesis over the last few months is that the abrupt influx of auxin will cause your finished product to contain more leaves, not less. This is true. Do you understand how and why that process takes place? 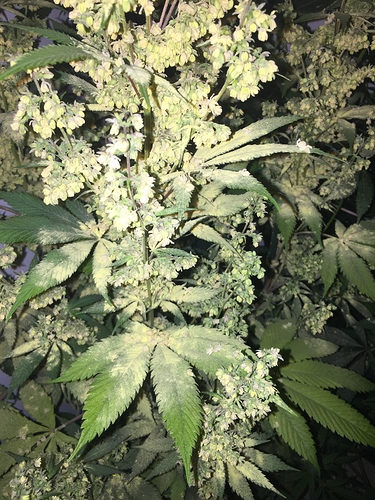 Not only that more leaf = less underdeveloped flowers, and your adding time to the overall flowering period by about 7%. When your plant is in repair mode [high auxin present] it's not in full tilt flower production. 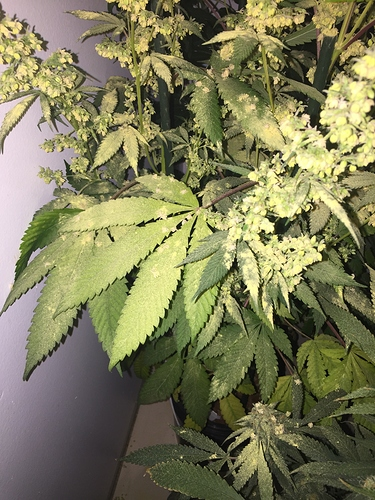 I always preach that if you are going to do any leaf removing, or trimming of any branches to have it done inside of 14 days in to flowering. Certainly anyone can get results from doing things differently. Any finished pics of the Cherry Bomb? Thought I posted a few here, perhaps not. I have two cuts in flower now that I am still playing with doing some testing. I'll try and post a few pics when they finish, but I did decide not to do any work with them. Very pretty strain for sure. Here are a few of the last I took apparently. I am really curious to see how the pink pistols look on finished bud. Have you smoked any yet? Looks like any other plant TBH. Only really shows in the flower room. I have tried it. Very Sativa yet light on the speed. More of an in your face closure of the eyes sort of thing. I put it away for a rainy day to let it cure longer and see if it changes and grows on me more. As a seed plant it took a lot of room which is why I am kind of staying clear of working with it. That may change if the cuts stay under control. I think they are only a couple of weeks in ATM. How much space did she take up? How long was veg? How much space did she take up? Mostly a height issue and finished about 6 1/2 feet. Was flipped at about 16". Took forever to get rolling and I wanna say vegged around 6 weeks to get to 16". Wall plug is at 3 1/2' off the ground for size reference. Only thing I kept was the 3 foot top it had. The rest was mostly larf. I sent you a couple PM my man, can you please reply. Thanks. She looks great. Sativa dominant for sure! This is so exciting! How many W/ft2 was she under? Container size? 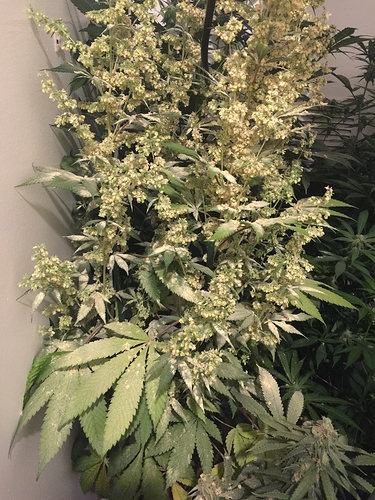 Any pics of final dried? 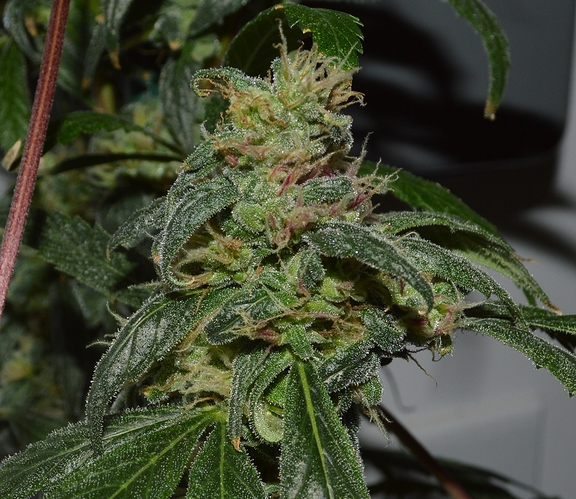 Would you say the smoke is a Hybrid while the Sativa traits are more in appearance? Apologies for the many questions. I am curious because I am going to run a few of these over the next 6 months. I will be applying 120W/ft2 minimum. Flowering in at least 20 gal. Would it be foolish to transplant right at flip? 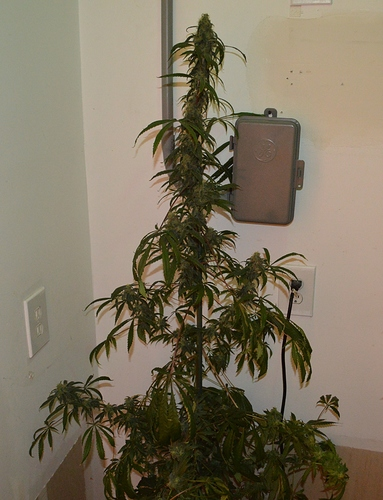 I plan on tying down the top Cola at 4' to encourage outward bushing. I will have 7' headspace. I love Sativa, so I want to master their growth. I want to maximize yield and potency and share what I discover with OG. Well well well. What studdly male is this? Looking good in there brother. That would be the daddy to your Christmas time testers. You ready? The one time I worked with you it went well buddy. Sorry I didn't get more opportunities.